Home > news > Why are Mediterranean Fisheries Failing, while Atlantic Fishing Improves? Why are Mediterranean Fisheries Failing, while Atlantic Fishing Improves? The dire state of Mediterranean fisheries has been chronicled by innumerable researchers for many years. It is now reaching a tipping point, with almost half of its sharks and rays threatened with extinction, 96 per cent of fish stocks overfished, while the number of top predators have declined by over 40 per cent [1,2,3]. While North Atlantic fisheries have been slowly but surely improving – thanks to progressive implementation of the Common Fisheries Policy – the Mediterranean seems doomed to an ever spiralling downward trend . In the last 12 years, Mediterranean fish stocks have decreased by 20% – with some close to collapse, while Atlantic have increased by 35%. But is the Med situation really due to complex social and economic variables and the stance of non-EU countries, as is often suggested by some in the industry and EU governments? A new paper by scientists suggest that if EU Governments would just start listening to scientific advice, and start setting and controlling sustainable catch limits for major fish stocks, we could turn the fate of these ancient fishing grounds around . The Common Fisheries Policy (CFP) binds EU countries to restoring and maintaining populations of fish stocks above levels which can produce the maximum sustainable yield – the highest rate of ongoing exploitation without affecting reproduction – by 2015, or 2020 at the latest . This law was reformed after a decade of European overfishing, in order to halt the decline in fish stocks, fishing jobs, and food security, and to ensure long-term environmental, social and economic sustainability. Three years have passed since the reformed CFP came into force, and yet the Mediterranean EU fisheries for which we have scientific data (still only a fraction of the whole), continue to be fished above their annual sustainable rates. Rather than improving towards the required sustainable levels by 2020, their populations are deteriorating. In fact, fishing rates for the main demersal and small pelagic stocks of the Mediterranean Sea that are exploited solely or mostly by European fleets, are around three times higher than the sustainable level, and have been this way for more than ten years . Why is the reformed CFP effective in improving Atlantic fish stocks (albeit slower than the CFP requires), but not the Mediterranean? One of the most outstanding differences between these two situations is the use of Total Allowable Catch (TAC) fishing limits in the Atlantic, which are slowly being set closer to scientific advice, whereas the Mediterranean is managed mostly by effort control (days at sea, gear restrictions etc) and even where effort is decreased, catches are still consistently, substantially above scientific advice . In the one fishery of the Mediterranean where science-based Total Allowable Catches have been enforced – Atlantic Bluefin Tuna – the fish stocks are undergoing significant recovery to healthier levels . This management change only came about after massive international efforts to save this incredibly valuable fishery from collapse. Industry opposition to TACS in other Mediterranean fisheries has been resolute, although Swordfish, another highly valuable species on the verge of collapse, was finally given a TAC beginning in 2017 . The CFP is European law, and right now EU member states are blatantly refusing to follow this law in the Mediterranean – the fishing industry is refusing to accept a change in how the fisheries are managed, even if it is in its long term interests. 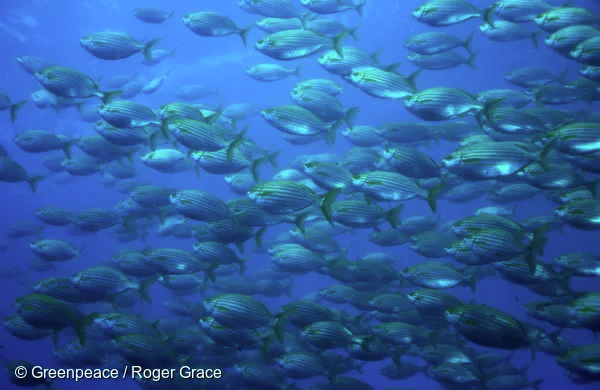 Whilst a range of approaches are urgently needed to bring this ancient sea back from the edge of ecological collapse , a TAC system based on precautionary, scientific advice is a proven strategy for sustainably managing fisheries. EU governments must start delivering on their obligations to implement the CFP and pursue a TAC system in the main Mediterranean fisheries as a matter of priority. Dulvy, N.K., Allen, D.J., Ralph, G.M. and Walls, R.H.L. (2016). The conservation status of Sharks, Rays and Chimaeras in the Mediterranean Sea [Brochure]. IUCN, Malaga, Spain. Oceana (2016). Mediterranean Sea, A key EU fishing region in a bleak state of overfishing. February 2016. Massimiliano Cardinale and Giuseppe Scarcella (2017), Mediterranean Sea: A Failure of the European Fisheries Management System. Front. Mar. Sci., 16 March 2017.